If I had to pick a moment that I fell in love with the genre of animation called anime, it would have been when I was a teenager and there was a series called Robotech on the television. For it's time, there was nothing else really on the television like it and it was the first time that I had knowingly watched Japanese animation. The storyline is fairly easy to catch onto but I'll give it to you here in a nutshell. Earth has experienced a space ship crashing which has united the planet from global warfare against each other in their efforts to rebuild the shattered machine. There is strange technology aboard this mysterious ship, yet no crew are there. They call the technology "Robotechnology" and are struggling to master it all and get the space ship into orbit when they are attacked by an alien race called the Zentraedi who have located the battle ship on their sensors and wish to retrieve it. The resulting mayhem that ensues are what makes Robotech such a very special series. One of the first things I noticed about the series is that the picture and sound were a bit funny to look and listen to. Not to the point that any detriment of enjoyment was suffered, however considering the age of the source material and how they would not have cared about the preservation of such material. The picture looks a bit grainy throughout and the sound suffers just a little bit. I guess I shock DVD purists with some of my reviews but I really didn't care about these little faults one iota. It is so cool to see that someone is collecting the Robotech series again. The way that the AV Channel are doing this series is breaking it up into lots of 3 DVDs per box set. The first two discs actually contain the episodes of the series even including the short animation when go to and returning from a commercial break for the television. The third disc is almost where they have gone crazy in the effort to give as much information as possible to all you Robotech geeks out there. 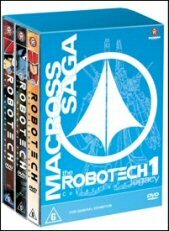 The director of the series Carl Macek goes in depth into every aspect you can imagine in Robotech, from the making of the series all the way through to the process of getting licensing to make toys based on the show. If there ever was a compendium about Robotech, this series is certainly a good start to it all. Another area that I enjoyed was seeing the show in a variety of languages and the difference that it made to the finished product. We really need to remember that Robotech is such an important Anime for the simple reason that is first time that such an endeavour was undertaken and Macek explains how Japanese cartoons needed to be brought into a Western marketplace and succeed. He's interesting to listen to, however you might want the audio up a little as he is very quietly spoken. Keep your eye out for this and the other boxed sets in the series!